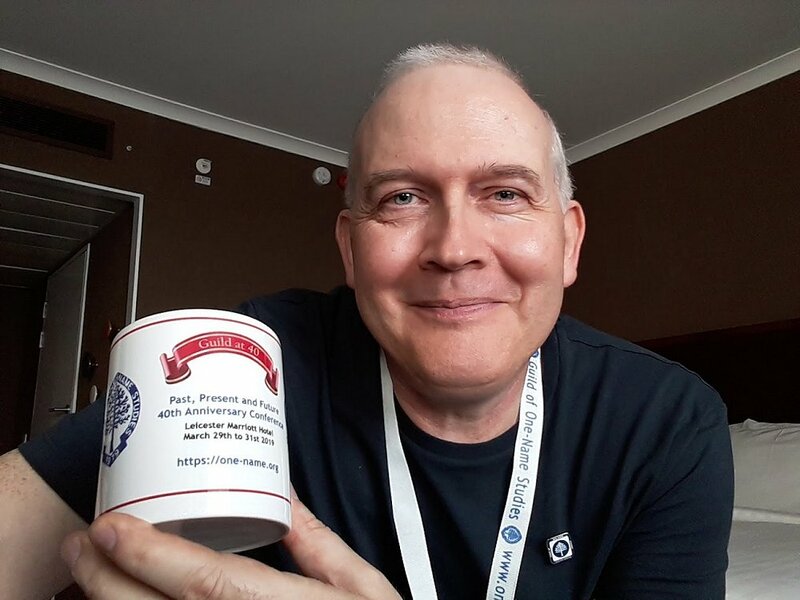 Last weekend (29 – 31 March) I attended the 40th conference and AGM of the Guild of One-Name Studies. 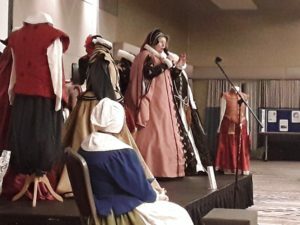 Appropriately, for a gathering to celebrate the Guild’s Ruby Anniversary, the theme of the conference was ‘Past, Present and Future.’ The range of subjects covered by the speakers certainly ensured that all aspects of the theme were covered! To learn more about the Guild, its anniversary, the conference, the Award of Excellence mentioned in the title of this article, and my involvement in some of these things, read on. In the 1970s, there were a few societies specialising in a single surname study. The Federation of Family History Societies (FFHS [soon to be rebranded as the Family History Federation]), newly formed in 1974, encouraged one-name groups to connect. At their request in 1975, the late Frank Higenbottam started a card index of one-name studies. This was taken over in 1976 by Col. Iain Swinnerton, who, after a thorough review, first published it in 1977 as the Register of One-Name Studies. By this time, over a third of the Federation’s member societies were one-name groups and organisations. The first weekend conference on one-name studies was held in Leicester in May 1978. 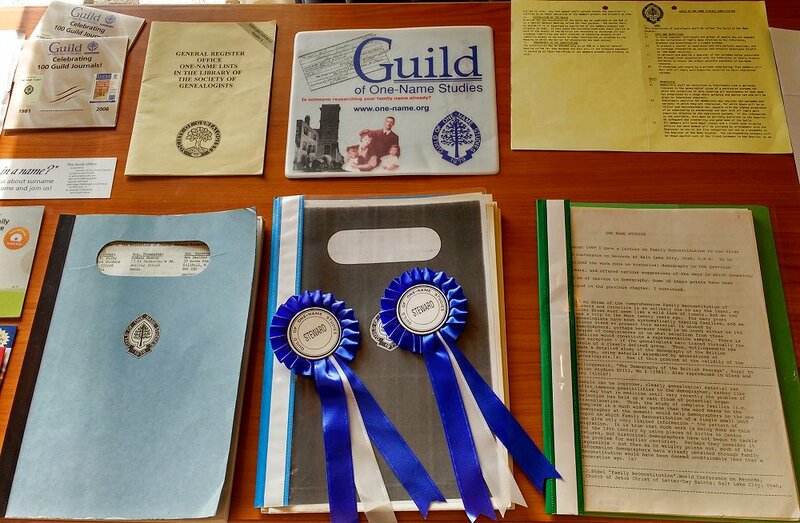 At that conference, it was decided that a new organisation for ‘one-namers’ should be launched, and the Guild of One-Name Studies formally came into existence on 1 September 1979 at a meeting in Plymouth. The new organisation was set up as a guild. The founders were keen to liken members to skilled craftsmen. They also felt that the acronym GOONS would be memorable, and would ensure that members didn’t take themselves too seriously. And so the Guild got going, as an organisation dedicated to excellence in the specialised genealogical field of the one-name study: research focussed on all the bearers of a particular surname (and variations of it) from the surname’s origin to the present day, and throughout the world, undertaken at each one-namer’s own pace. Anyone who knows me also knows that I don’t take myself too seriously. I am also a big fan of The Goon Show! So in February 2011 – at which point I had been researching the Atcherley family for a little over 3 years and this website was one month old – I was quite easily persuaded to join ‘the GOONS’ when I visited the Guild’s stand at my first Who Do You Think You Are? Live! show (see Echoes of the Past for my write-up of that event). I registered Atcherley as my study surname, along with its two most frequent variants (Atcherly and Acherley), and soon began to receive the Guild’s quarterly Journal of One-Name Studies (or JOONS) which provided me with all manner of fascinating information relating to genealogy in general, and surname studies in particular. Thus began my involvement with the Guild of One-Name Studies. Other presentations planted in the past were Paul Smith’s amazing story of Leicester’s adopted son Thomas Cook and the early history of commercial tourism (based on material in the Thomas Cook Archives), and Simon Wills’ wonderful overview of our ancestors’ travels by sea which covered why, how, where and by whom ocean voyages were made as well as showing us the websites where relevant records can be found (not just the big subscription sites!). Starting in the past and progressing to the present was Shirley Jones, who provided an enlightening look at the history of how the documents we use for family and local history are repaired and conserved. Many tried and tested techniques from the early days of the conservation profession have been refined or replaced, but some of the old ways persist. Apparently a porcupine quill is still a great tool for undoing medieval knots! Genealogy in the here and now presents a number ethical dilemmas – the subject, along with the psychology of searching, of a talk by Penny Walters. Some of those dilemmas have arisen from the explosion in DNA testing by genealogists and people who are curious about their ethnic origins. 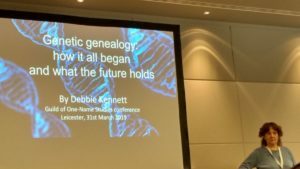 These issues were amplified in a talk by genetic genealogy guru (and Guild member) Debbie Kennett, who looked at the history of consumer DNA tests, where we are now (so many advances in such a short space of time! ), and where things may be heading in the future. Debbie predicted that we will see all-in-one tests (combining autosomal, mitochondrial and Y-DNA tests, the latter with the power of the current ‘top of the range’ Y-DNA 700) as standard. Look forward also to tests identifying rare / family-specific variants; improved relationship predictions; and closer linkage between DNA results and family trees based on traditional genealogical research (Ancestry’s ThruLines ™ and The Theory of Family Relativity ™ launched by MyHeritage are just the beginning). Debbie’s blog, focussing on her Cruwys ONS and genetic genealogy, is Cruwys News. The Future of Family History in a wider context was the topic of a thought-provoking talk by Nick Barratt. He noted that current trends in online data use (and misuse) were very relevant to the future of family history. New technology is also providing great opportunities for recording and sharing family history too, and not just by the ‘usual suspects’. Nick gave details of three ‘applied family history’ projects involving communities in projects which not only recorded personal and social history but also benefited those involved and the wider community. These projects illustrated the importance of collaborative working on family, local and social history and the many benefits arising including ancestral tourism, social interaction, even tackling dementia. In summary, family history improves the quality of our lives – building on this, contributing our expertise and involving more people in researching, recording and sharing our history, is the future. The past, present and future of the Guild of One-Name Studies itself was, of course, also very much to the fore over the weekend. On display in the conference room were items such as newsletters and minutes of meetings from the Guild’s earliest days. Ruby Anniversary mugs were presented to those original members of the Guild who were present, at the end of the AGM, and it was good to see so many there. We heard from some of those founder members, along with others who had joined the organisation later in its history, after Saturday evening’s Anniversary Banquet, in a touching and sometimes humorous series of short speeches. Former Guild Chairman Paul Howes gave us the low-down on a special project run by the Guild to mark its 40th anniversary, the Ruby One-Name Study. A collaborative endeavour, this study has been pulling together records of people from the past with the surname Ruby (and variants) and building their family trees. Findings so far include the origins of the surname and some social history discoveries, along with some astonishing stories from individuals bearing the Ruby name. A great example of what one-namers can do when they work together! In her interactive session The Guild, Let’s Celebrate, Guild Secretary Julie Goucher highlighted some of the many advantages of Guild membership, a lot of which again illustrated the power of people working together. These include the Members’ Website Project, the Guild Probate Index, regular seminars on a wide range of topics (open to non-members too), and a network of Regional Reps. The Guild’s biggest asset though is its membership, with its combined wealth of knowledge (which we are happy to share). We share with each other within the Guild, providing a great network of mutual support for each other’s genealogical quests, and we share with people outside the Guild through many different channels. There’s much more we can do to further the Guild’s goals too. 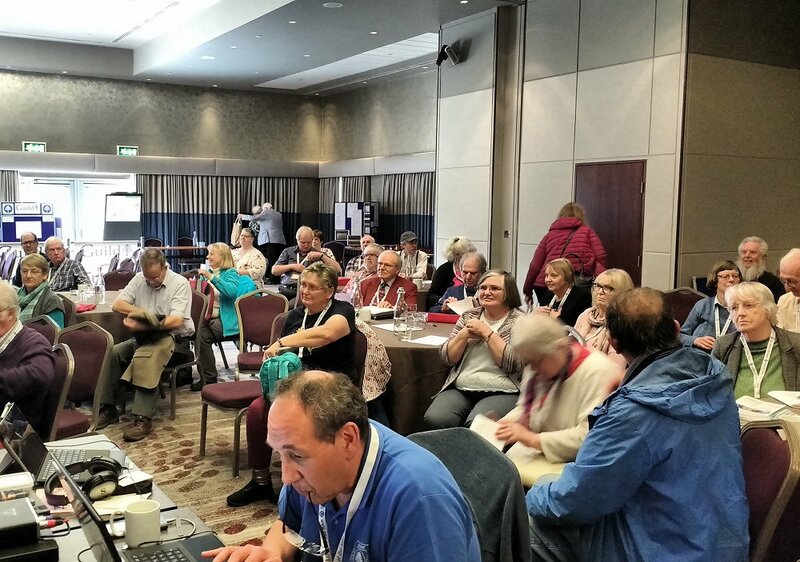 The importance of volunteers to the Guild – people willing to get involved in making things happen – was emphasised not only in the course of Julie’s session but also during the Guild AGM on Saturday morning. Activities which engage and involve Guild members, potential members and others, don’t happen without people to drive them forward. So what about my future with the Guild, and the future of the Atcherley ONS? Well, in the not too distant future I will have more free time to play with. Lots more in fact, as I am taking the opportunity presented by a voluntary exit scheme at my place of work to retire from working life unexpectedly early. I hope to devote some of that free time to the Guild, answering the call for volunteers! And naturally, I will be spending a lot of it pushing my Atcherley research back into the past, and pushing the presentation of my findings – on this website and through other avenues – forwards into the future. Talking about this website leads me neatly to the Award of Excellence which I am sure you have been patiently waiting to read about. Each year at the Guild’s AGM, in addition to the award of ‘Master Craftsman of the Guild’, Awards of Excellence are made to members for books, articles, newsletters, periodicals, websites and blogs which meet the award criteria. At this year’s AGM, I am pleased to say, Atcherley.org.uk was the sole winner in the website category. A huge ‘Thank You’ to fellow one-namers Pam Smith and Liz Craig for nominating me, to the panel of judges who agreed that this website is worthy of the award, and to the many well-wishers who have said the award is well deserved (and many more complimentary things besides! ).